Just like other artists, most game designers have their unique style. Not all of them, mind, some are like chameleons. But there are some that you play a game and halfway through the explanation you go ‘Is that a … game?’. Vital Lacerda is one such designer. His games are like handmade pocket watches, they have a large number of moving parts and moving something has consequences everywhere. Take an action here, and by the exact space you pick you select a bonus that you can use for another action over there, where you pick up another bonus tile that will be worth points based on things you do somewhere else. His games are intricate, and they can actually be a bit of a pain to teach because you don’t find a natural place to start from. Everything is affected by something else. 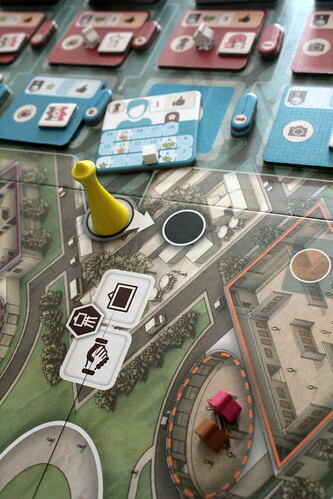 The Gallerist, Lacerda’s latest design released in 2015, is a perfect example of his style. In it, each player runs a gallery, not for the sake of art but for the sake of profit. And although there are only four locations to visit, each with two actions you might take there, the interconnected design makes it challenging to really get into just reading about it. So, the basics first. Each player has their gallerist pawn, that’s the guy who does all the work. They also have meepsistants (meeple assistants), but they are a resource in this game, not workers in the sense of a worker placement game. 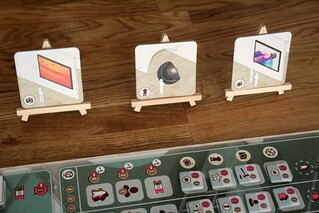 On a player’s turn their gallerist will usually start on one of the four locations. The player may move to one of the three others and take one of the actions there, but he may not stay in the same place. Now, on their turn a player only has one main action and, optionally, an executive action. But each action takes several steps to complete and often you can’t make a final decision what you’ll do until your turn starts, so turns are not short. In four players, that would mean a lot of waiting time. I say would because, to keep everyone involved in the game, there are Kicked-Out Actions. You get one of those when another player moves into the location where you took your last action. That player finishes their turn, you take your Kicked-Out Action before the next player. When kicked out, you may either take an executive action or pay some influence points to take a main action at the location you’re being evicted from. Executive actions are short and if you choose the main action you only have two options to choose from, so Kicked-Out actions don’t slow down the game much for everyone else, but they keep everyone in the game. With that out of the way, what are those locations and actions? Well, lets start with the Artist Colony. Even if you’re running your gallery for profit, it’s generally considered polite to display some art. The colony has eight artists, four promising beginners and four more experienced ones. One of each works in photography, painting, sculpture and digital art. Most of these artists are undiscovered when the game starts. Discovering an undiscovered artist is one action at the artist colony. In doing so you turn over the artist tile. It also gives you that artist’s bonus tile with a beneficial effect somewhere else and a commission from that artist. Commissions are awesome because, no matter how famous the artist gets, he’ll complete the commission for the same price you would have payed when you discovered him. The other option here is to buy art and put it up in your gallery. To buy, you pay a price based on the creators fame. As a result, the creator becomes more famous, in turn increasing the value of all his works. As a bonus, you gain Tickets that you can use in an executive action to move visitors to your gallery. More on those guys later, moving them will be important. This isn’t art for art’s sake, though. This is art for profit, and our next stop will be the Sales Office. Going here, your two options are to sign a contract or to complete a contract and sell some art. Contracts are simply for a specific medium of art. For instance, when you have a contract for a painting, then any painting will do. Signing a contract is as simple as can be. You pick one contract from the four available and put it on a space on your player board. Selling is not much harder. You remove a matching piece from your gallery, take money and flip the contract card over. But it’s never that easy. Every contract card has a bonus space on the front side. As an executive action, you can move an meepsistant to that space and take the bonus. That’s nice, but the meepsistant is stuck there until you complete the contract and flip it over. Once you do that, the backside of the contract has two more bonus spaces that work the same way as the front. One of those spaces will give you money, the other influence, both based on the color of visitors in your gallery. You decide which of them is open by removing a visitor from your gallery as part of the sales process. I imagine that is the visitor walking out with his new painting, leaving the gallery. And of course the visitor you remove is one that would benefit you for the bonus, were he still around. Meepsistants placed on the completed side of a bonus card have a good chance to stay there for the rest of the game. You will need more than the two you start the game with. Hiring new meepsistants is one reason to visit the Media Center. You pay a one time fee to hire and get more meepsistants. And some of them, again, come with bonuses attached, mostly in the form of tickets. Or you might go there to promote an artist. The effect of promoting should be obvious, the promoted artist gains fame. How much depends on the number of collectors in your gallery. Collector is one flavor of visitor, and the more you have the more fame promoting brings. You pay for that with your influence, and once again there is a bonus attached to the promotion tiles to take into account. That leaves us with the last location, the International Market. The market is a long table with three columns and the main sink for meepsistants. Each space in the market can take only one meepsistant. The three columns have a requirement of what color of visitor you must have in the lobby of your gallery. Not in the gallery proper, in the lobby. I’m getting to the visitors, just bear with me. One action at the market concerns the top four rows where you find reputation tiles. Those tiles award extra money and influence when the game ends, based on some condition. When you take one, it covers another bonus space on your player board and you take the covered bonus immediately.The remaining three rows are there to make a bid on internationally renowned art. You pay money to place meepsistants here. That money goes towards paying for an extra work of art in the endgame scoring. And, you guessed it, these spaces give you different bonuses as well. There is literally no decision in The Gallerist that only has one single effect. We’re almost done now, there is only one more thing to explain for the basics. Visitors. 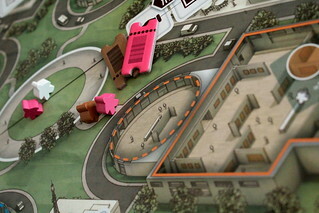 The main board has a plaza at the center where visitors enter the game. Around the plaza are the players’ galleries, each with a lobby and the gallery proper. Visitors come in three colors, matched by the three colors of tickets you get for many bonus actions. Pink VIPs are good for your influence once they are in your gallery proper, brown Investors for your money and white Collectors do a bit of both. A ticket of the matching color lets you move a visitor one step: from the plaza to your lobby, from your lobby to the gallery proper. Or from an opponents’ lobby back to the plaza, if you want to play like that. You need them in the lobby to use the International Market, in the Gallery to reap their benefits with bonus tiles. And when certain things happen, a sale for instance, they tend to leave your gallery again. Applied Art Criticism – What do we think? If you got to this point reading through the rules summary above, you probably have no idea how everything ties together. Don’t worry, you’re in good company. After going through the rules the first time, we had no clue what to do or how to score points. It was about halfway through the first game that things started making sense, and only with the end game scoring did we realize what we should have done. That’s not because the rules are badly written, they’re actually very well structured. But everything in The Gallerist is so tightly connected, actions have so many different consequences that reading is not enough, you have to actually do. I’m just talking about game mechanics, mind. Good strategy is a whole different Pollock painting. The Gallerist is certainly a complex game.That should be clear from the rules summary, and we even omitted some parts there. The intricacies of the influence economy, for instance. Parts of the endgame scoring, too. You win by having the most money, but secret goals for exhibiting and selling the right kinds of art come into that. And I’m sure there’s at least one more thing I’m forgetting. But more than with most games at this level of complexity, I’m glad that I made the effort. 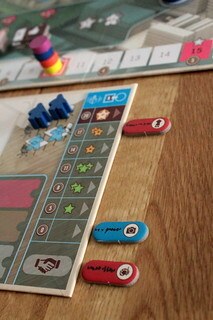 Once you understand how the cogs fit together The Gallerist reveals an amazingly elegant design. Nothing you do is complicated in itself, but everything has more than one effect on the game. Decisions in this game are thus very rich. Everything you do is important, no turn is meaningless and it’s almost impossible to lose because of bad luck: the only random factor during the game are the contract cards and the visitors added to the plaza. However, interaction plays an important role. You want to predict which location opponents will visit to gain Kicked-Out Actions, because more actions are never bad. You want to collaborate with others to promote an artist you have a shared interest in – or not, if the other player is ahead of you. And you want to know when that is the case. Really, there’s nothing bad I could say about The Gallerist, even if I tried. If you enjoyed Vital Lacerda’s CO2 then The Gallerist gives you more of exactly that, only more distilled. I’d be tempted to call this game Lacerda’s masterpiece, but that might not leave space for his next game. Lisboa is due out next year, but until then I don’t think anything will take the place of The Gallerist in my collection.